Onsight Embedded offers a proven virtual presence experience that brings the power of video to your own custom applications immediately. Using the Onsight Embedded SDK, enterprises integrate Onsight into their own uniquely branded and customized mobile app, adding the power of live video to existing workflow applications. The Onsight Embedded SDK includes sample code, API documentation, and direct support to provide application development teams with the tools they need to embed Onsight quickly. Access Librestream’s hosted platform and centralized management tools for full support. This scalable and reliable infrastructure currently powers Onsight enabled devices worldwide. Librestream also offers a custom branding services for enterprises that prefer to provide a branded solution instead of a fully integrated app. This service is often an interim solution for enterprises as they formalize their application development programs. 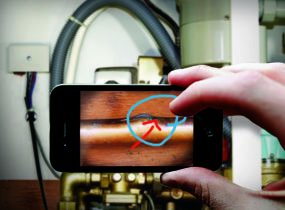 Onsight Embedded integrates this live video diagnostic capability to streamline workflows and applications – powering smartphone and tablet apps, enabling wearable hands-free collaboration use cases, and integrating within existing enterprise applications running on the remote specialist’s computer. Remotely control the camera to get the right visuals and reduce training for the field. Seamlessly bring cell phone calls into Onsight video sessions. Use Onsight Embedded to provide a completely custom branded experience. Tag all Onsight sessions including recordings and image captures. Use the device already in hand - smartphone and tablets - or wearable and specialized hardware to fit unique environments. Onsight was built for challenging field network environments - performing with less than 64 kbps. Get a live demonstration of Onsight Embedded and the Onsight Collaboration Platform.